A custom snow globe is a perfect gift idea. 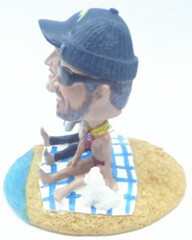 This snow globe features a couple of males sitting on a towel in the sand at the beach. On their blanket, we feature 2 small dogs.